Did you know there is a company called Ship Foliage that sells New England maple leaves over the Internet? That’s right, for $19.99 you can have three professionally preserved leaves; five will cost you $29.99. According to the company’s website, it’s their way of sharing the beauty of New England’s fall with the rest of the world. Luckily for us here in Ontario, we don’t need to have fall colours shipped in. All we have to do is step outside to enjoy fall’s majestic display. With the colour change season just around the corner, we have put together a list of places to visit and activities to try to help you plan your leaf peeping adventures. Of all the places in Ontario, the view from Killarney’s Crack outlook is hands down my favourite. It is spectacular any time of the year, but fall colours ‎against Killarney’s signature white cliffs and make the view irresistible. You will have to work up some sweat to get there. The trail to the top of the Crack is six kilometres round trip and has some steep climbs and difficult sections, but the view is definitely worth it. 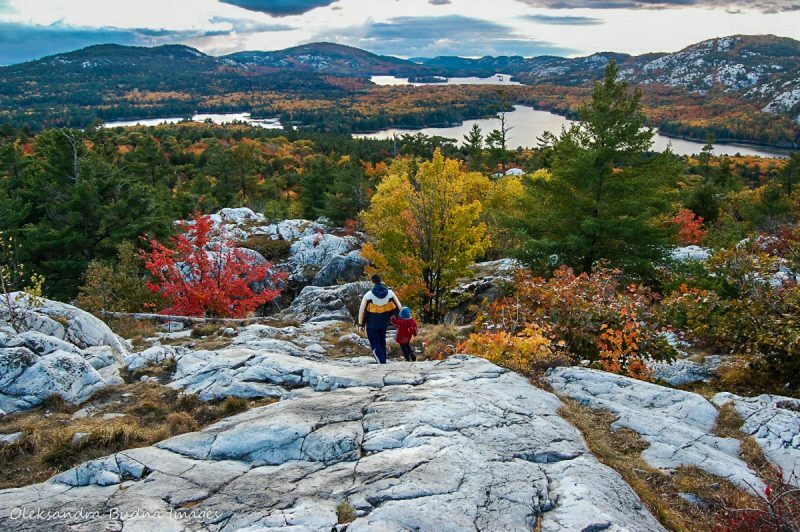 If you are looking for an additional challenge, try hiking Killarney’s highest point – Silver Peak. Bell Lake is the best way to access the trail to Silver Peak, which is 5.7-kilometres-long. So with all the paddling and hiking, you are looking at a full-day adventure. Canoes can be rented from Killarney Kanoes right by the lake. If you don’t have a full day or would like to take it easy, Granite Ridge Trail is another popular hike. This 2 km loop offers great views of Georgian Bay and La Cloche mountains, and should take about an hour and a half to complete. Muskoka continues to occupy top spots on fall destination lists not only in Ontario but across Canada. And what a better way to see its spectacular display of colours than from the Dorset Lookout Tower. The tower stands 142 metres above the Lake of Bays and provides 360 degree views of surrounding Muskoka and Halliburton counties. There is a 2.3 hiking trail in the surrounding forest so you can explore at the ground level. Algonquin is, of course, known widely as the fall foliage mecca, which means large crowds, especially during weekends in October. Some spots, like Lookout Trail, get the most traffic. There are ways to get around it: go in the middle of the week, ‎try some longer and, therefore, less popular trails, like Track and Tower or Booth Rock, or go canoeing. With over 1,500 lakes, Algonquin was meant to be explored in a canoe. Imagine gliding over the smooth surface of a lake, surrounded by fall’s tranquil beauty, maybe spotting a loon or a moose through the milky morning mist. Canoe rentals are available at The Portage Store on Canoe Lake and Algonquin Outfitters over at Opeongo. Canoes can also be delivered to various campgrounds in the park for a small charge. Try canoeing from Lake of Two Rivers to Rock Lake. 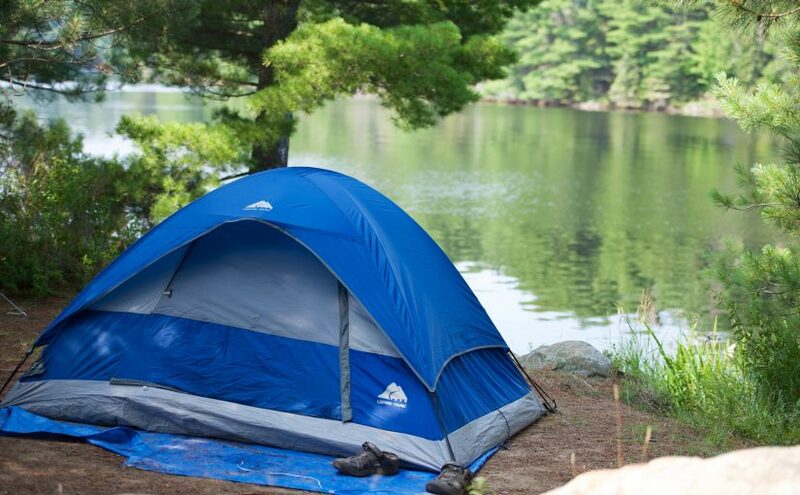 With only one 50-metre portage, you can enjoy hours of uninterrupted padding. While technically not located in Ontario, Gatineau’s proximity to Ottawa, 165 kilometers of trails and deciduous forest boasting every possible hue from bright yellow to crimson red make this park a perfect fall destination for eastern Ontario’s residents. The park offers lots of trails to choose from. Try hiking the Champlain Trail, a 1.3-kilometre trek along the Eardley Escarpment. It starts at Champlain Lookout, the most famous point in the park, and offers spectacular views of the Ottawa Valley. Pink Lake Trail is another great hike. This 2.5-kilometre loop goes around a rare meromictic lake. Contrary to its name, the water in the lake is turquoise, which in combination with fall foliage and surrounding cliffs makes for a beautiful sight. Looking for a more challenging hike? Try the Wolf Trail. This steep 8.3-kilometre trek will take you through mature forest to one of the highest points in the park for some magnificent views. Niagara River is a great place to enjoy fall colours in southern Ontario. But instead of heading to the usually crowded Niagara Falls, why not go for a spin along the Niagara River Recreation Trail. This 53-kilometre route follows the river all the way from Fort George in Niagara-on-the-Lake to Fort Erie. ‎Except for a couple of breaks in Queenston and Niagara Falls, where you have to bike along city streets, this paved path is restricted to non-motorized vehicles only. My favourite stretch of the trail is between Niagara-on-the-Lake and Queenston. Winding through some of the prettiest countryside in the world (according to Winston Churchill, no less), this trail is a feast for the senses: explosion of colours lining up the Niagara River, roaring waters, smell of fallen leaves. Add to that wineries and fruit stalls that offer a glimpse of Niagara’s fall bounty and you’ve got a recipe for a perfect fall getaway. Crawford Lake, part of Conservation Halton, has a bit of everything: a reconstructed 15th century Iroquoian village, over 19 kilometres of trails, beautiful lookouts and a unique meromictic lake. And with the forest exploding into fiery colours, it makes for a perfect fall destination. It is on our family’s list of favourite weekend spots for all the reasons listed above, plus an abundance of geocaches hidden along the trails. Start your visit by exploring the Iroquoian village and taking a self-guided Moccasin Walk, which offer a glimpse into the life of people who lived around Crawford Lake 600 years ago. If you want to hit the trails, try the 2.4-kilometre Escarpment Trail. This loop will take you to the edge of Niagara Escarpment for some spectacular views of Nassagaweya Canyon. Looking for a challenge? Hike the 7.2-kilometre Nassagaweya Canyon Trail all the way to Rattlesnake Point, another of Conservation Halton’s popular parks. 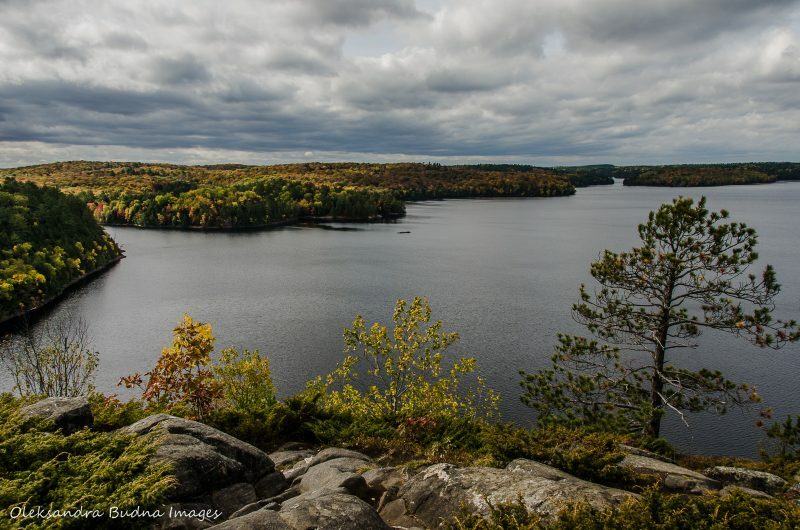 Make sure to check out the view from the Buffalo Crag Lookout Point before heading back to Crawford Lake. What could be better than walking through the blazing forest canopy or gliding above the treetops? You can do both at Scenic Caves park near Collingwood. Its treetops forest canopy walk will take you though a web of walkways 3 metres above the ground. And you can fly like a bird down Canada’s longest twin zip line with a kaleidoscope of autumn colours flashing below. If that’s too much adrenaline, there are other activities in the park. Located at the highest point of Niagara Escarpment, it has no shortage of magnificent views of Georgian Bay and surrounding countryside. Suspension Bridge, the longest in Southern Ontario, is a great place to catch those views. Looking for something more challenging? Try the Caves Trail which will take you through a labyrinth of caves and crevasses, as well as a number of spectacular lookouts. The trail should take 1-2 hours to complete. Overshadowed by its more famous neighbours, like Algonquin and Arrowhead, Restoule seldom gets onto the lists of best places to see fall colours. And that’s one of the reasons why you should visit it this year. The park rarely gets crowded and you can have the campground practically to yourself. Imagine waking up to the fiery beauty of the forest with hardly a tent or trailer in sight. The park has a lot of activities to offer. The Fire Tower Trail is one of the best ways to enjoy fall colours. At seven kilometres, it is on the long side but you will be rewarded with spectacular views of Stormy Lake from its 100-metre-high bluffs. Biking is another popular activity in the park. Restoule has a couple of short, moderately challenging biking trails, and ‎a longer Gibs Trail, which takes you out of the park into adjacent crown land. If mountain biking is not your thing, you can simply cruise along the park’s roads. Bicycle rentals are available in the park. If you are looking for a new experience this fall, consider the Agawa Canyon Rail Tour. The train travels from Sault Ste. Marie up north into the 1.2-billion-year-old Agawa Canyon past towering trestles, beautiful northern lakes and rivers, granite rock formations and, of course, a kaleidoscope of colours. Eventually the train pulls to a stop and you get an hour and a half to explore Agawa Canyon Wilderness Park. There are several trails in the park. We recommend the Lookout Trail which climbs about 76 metres above the tracks for spectacular views of Agawa Canyon, once an inspiration for the Group of Seven. The trail is a combination of paths and 300 steps and should take about 40 minutes to complete. For a less challenging adventure, take the River Trail past the Black Beaver Falls all the way to the Bridal Veil Falls. Then follow the Talus Trail along the canyon’s west wall to return to the train. The whole trip should take about 40 minutes. The stretch of Highway 17 hugging Lake Superior’s northern coast is definitely on the list of my favourite drives. With cool blue waters of Lake Superior on one side and wooded hills dressed in their autumn best on the other, the views are ‎nothing short of spectacular. The whole distance from Sault Ste. Marie to Thunder Bay takes a little over seven hours to complete. You can choose a portion of the route or break it into several days with stops along the way for a more up close and personal experience. Edmund Fitzgerald Lookout Trail in Pancake Bay Provincial Park, Awausee Trail in Lake Superior Provincial Park, a hike to the Top of the Giant at Sleeping Giant Provincial Park, among many others. This list is just the beginning. With so many spectacular places to enjoy fall colours in Ontario, your next great leaf peeping adventure could be just around the corner. My favourite place in Toronto is High Park. Most of all, I enjoy getting off its well-trodden paths and explore less known trails.